Later, it turns out that Sven is NOT 4F, but a German spy! JC and AH band together to expose his perfidy (he was hypnotizing his subjects during massages to extract secrets VITAL TO THE WAR EFFORT) and they each get a medal. They don't wear these dresses to the medal ceremony, just so we're clear. What do you think is going on in this illustration? I think you nailed it, Erin! Betsy who prefers sandals and ruffles, has just told her counterpart, Marie, of the black tresses and a distinct preference for polka dots, that her Jolene Creme Bleach isn’t doing the job on her rather impressive mustache. Marie having contemplated knocking Betsy into next Tuesday, decides to act the lady and has told Betsy that her deodorant has failed yet again and it’s the joke of the neighborhood. Stripe has been hypnotically implanted with state secrets that she doesn’t know that she knows. Dot is a German spy, and is hiding a syringe of Truth Serum behind her back! She’s giving Stripe one last change to spill, but Stripe is of course denying all knowledge. I think the illustrator hated drawing hands…and judging from the stealth claw emerging from Joan Crawford’s hip, I can see why. That’s why they’re nail technicians…they make other people’s hands pretty…because theirs will never be. Stripes, a femme fatale with a flair for personalization, just absconded from the mental ward (hence the walking about town in a hospital gown) without the doctor’s permission, but with an extra bottle of opiates.Dottie, one of the first female detectives is just about to take her into custody when; alas, Stripe’s son turns the corner on his way to his babysitter’s after elementary school.Dotty ever mindful of Stripe’s pride and the child’s emotions, quickly hides her handcuffs behind her back. Ohhh, Erin!! Is this another book in the works??? Can’t wait! Am I the only one troubled by the length of Stripe’s arm? This is, so help me, a still from the little-known movie Joe or Jane? (The working title was Joe or Joanne?, but it didn’t roll of the tongue as easily. )In this heart rending scene, the wife returns early from A Trip to Mother’s, to find her husband (left) has used one of her sewing patterns to run up a secret housedress for himself! (She has a rolling pin behind her back, with which she was going to hit the intruder, as she thought her husband had used the time apart to embark on a fishing trip and was startled to hear someone in her sewing room. )Originally a tender domestic drama pleading for tolerance, the studio inserted new scenes in which the Germans brainwashed Joe while he was a POW, then groomed him to be an unsuspecting operative on American soil.Eventually, the Pentagon objected, so the film was pulled from release and all copies destroyed.COME ON, PEOPLE…..GREEN STRIPE LADY IS A MAN! Joan: Well, the pattern said “Simple to Sew”.Angelica: This is what happens when you mix one pattern, two women and no hands.Joan: Yeah, this can opener wasn’t much help.Angelica: Nice ruffle.Joan: Only one pocket, though? What’s up with that. ONE pocket?ONE LOUSEY POCKET!Angelica: The perfiy. Perhaps some sort of spy plot. Perfidy. I always muff the punch line. Thanks ?Cookie, I didn’t want to say it and seem insensitive. ” Deirdre said… Woman in green: “You look like hell in that dress.”Woman in brown: “I slept with your husband.”:OMG!!! LOL LOL! Cover story for ears in the walls:Joan: Did you hear that someone has been spreading rumors that I am, in fact, a man?Angelica: Really? Whom do you suspect?Joan: Well….Actual secret spy message: Joan: Can you keep Sven occupied while one of our girls goes through his belongings?Angelica: Offfff course, dahling. I can be very distracting, you know.Joan: I cannot believe he convinced all those women to allow tiny flesh-eating fish to nibble on their toes and call it a pedicure.Angelica: Well, I admit that one tickled me a bit.Joan: To think, they blame ‘loose lips.’Angelica: How long do you need?Joan: About 20 minutes should be fine. If he has that crossword puzzle with the code in it, we’ll find it somewhere obvious. Thanks, Cookie, I didnt want to say it and seem insensitive. Thank you for backing me up on this, Theresa. I think several things have made us see drag queens in some of the recent pattern pics. 1.) The artists are not always that great, anyway, and some have a hard time really delineating a human face or figure, 2.) We’re so used to seeing the vintage, idealized, hyper-feminine style in other illustrations that when one of these figures looks “different”, our Red Alert sounds, 3.) We’re now wary of being tricked again by drag queens on sewing patterns, and are just LOOKING for the least little indication to drop the net!Is there a support group for us? 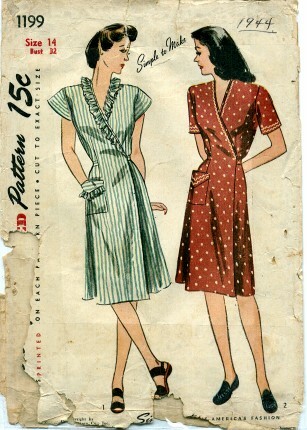 Will vintage patterns ever look the same to us again?? These are house dresses. The “gals” are making catty remarks about each other’s sloppy housekeeping. I am pretty sure that green stripes has some kind of insanely long squid arms with backwards hands. look at her! she has some kind of tentacle extending from her right shoulder, behind her hips, and peeking out on the right. In fact, I’m not convinced that what appears to be her left leg doesn’t actually start at her left shoulder. “Sandals” Mcgee: Well, I know we all lost our jobs down at the plant because of course, the boys coming home need the work, but how am I supposed to pay my rent? I already sold all my clothes except this smock…”Chili Pepper” Fosse: At least yours has ruffles! My man came back from the Pacific theater with certain “ideas” about the bedroom! And don’t get me started about the screaming in the middle of the night.”S” McG: I suppose dealing with the harsh reality of sexism in the workplace is not as difficult as living the reality of dealing with a broken, but hidden, psyche.”CP” F: (hahaha) No no. I mean it would take a massive meltdown of the financial system to match the forced unemployment we gals have seen! At least my man can buy us a house and go to school with the GI Bill!”S” McG: You’re right. I could no more complain about my lost independence than you could about living a reality completely dissimilar from how people will one day view this era.”CP” F: (hahaha) Say, when I hold my arms like this, can you see the bruises?”S” McG: …”CP” F: Um, uh … Did you see the new fabric down at the Ben Franklin? Dot: (under breath) You little snake. You are just trying to steal Robert away from me—I never should have told you he has a fetish for wrap dresses with one pocket! And I thought you were my friend. I thought I could trust you!Stripe: Nothing personal, honey. It’s every man for himself. And I have ruffles. Face it, you’re beat. There’s no competition. My dress is better.Dot: Ha! YOUR dress? I happen to know that Robert thinks rick-rack trim is MUCH more attractive than a bunch of frilly ruffles. You look like a little school girl. Nice try, you little thief. Strip: Listen, darling. Don’t mess with me. You don’t have a chance. I am prettier, cleverer, a better seamstress and I have a wicked claw that could scratch your face off in a second (see?). What would dear Robert think of you then, with your pretty little face covered in scars? Heh heh. cookie, maybe we should start one and soon I am starting to look supiciously at tall women in the office…It probably is the poor quality of the drawings…or maybe that’s what they want us to think…Whne I lived in Houston, in Montrose on Friday nights the Drag Queens were every where. My mom lived a sheltered life and she was confused by all these tall, stunning women. My sister and I said “Mom, there men. Let’s go. This just caused my very sweet mother to gawk in disbelief. I was afraid someone would think she was just being mean, but honestly she was blown away she had no idea Drag Queens even existed. Oh, I think you nailed it. I almost fell out of my chair laughing! Local: outside on the sidewalk near some tready apartments.Stripes: “Really you think she would be more discrete considering.”Red “yes but just think.. they were right there I mean I could just see them plain as day from my balcony!”Stripes “Surely you could have not seen what you thought you saw”Red “I am not that far. I know I saw what i thought I saw”Stripes ” Well I hope She doesnt think she is going to get away with that at my HOUSE!”Red “But do you know what is really happening when your gone?”To be continued……. Green Stripe and Brown Dot are the same woman, separated in time by five years. Brown Dot wistfully wonders if she will ever find a husband, or if she is doomed to spinsterhood and feeding pigeons at the park.Green Stripe, now a respectable matron and mother of three, is looking back on her single, angst-ridden self from five years past. With a tender, but knowing, smile, she says,”Honey, be careful what you wish for. You just might git it.” LOL. On a related note, I just received a wonderful new book on the house dress as a gift:The House Dress: a story of eroticism and fashion, which looks at the history of the house dress and its presence in cinema.http://www.amazon.com/House-Dress-Story-Eroticism-Fashion/dp/8831795252/ref=sr_1_2?ie=UTF8s=booksqid=1236743886sr=8-2Sweet. To me, it looks like nothing so much as a dance lesson. Green Stripes is demonstrating a very straight-backed version of the Charleston, while Red Dots looks on attentively with her hands behind her back. In a moment, she’ll be dancing too. movies in the world of pattern envelopes would be amazing! Green to Red: …Behind the back is so conspicuous. I nonchalantly slip my hook-hand in my pocket and no one’s the wiser.